6 Lessons in Motivation: Doing work on Your Goals - CrossFit Tigard P.A.W. 92% of people don’t accomplish their goals. Otherwise we’d all be rich and have six packs, right? We might start off with a fervor, but before long we hit turbulence, get distracted, or move on to something else. Despite our best intentions, willpower IS an exhaustible resource. Without a solid action plan, goals eventually get put on the back burner. Motivational quotes and memes will only get you so far. Eventually you have to sit down and do the work. 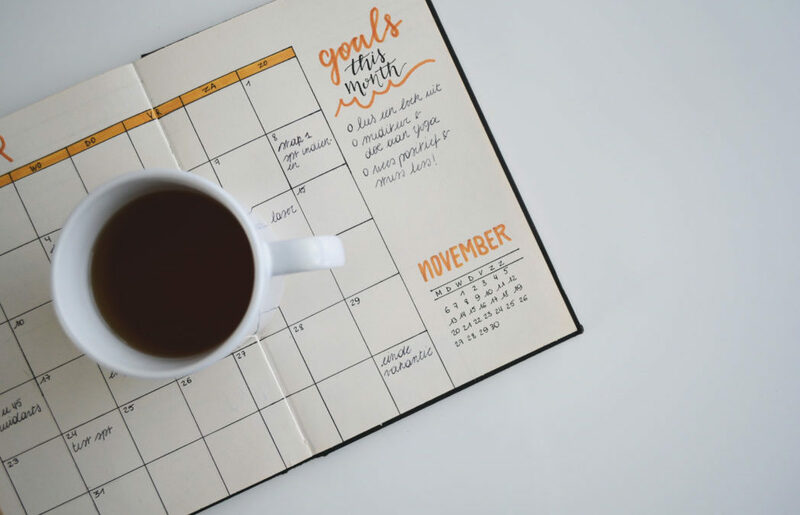 Here are my top tips for setting actionable goals and keeping on track. 1. Have a goal that Inspires you. Seriously. Why are you doing this? Losing 10 lbs because it “seems like a good number” isn’t motivating. Why is 10 lbs (or 20, or 30+) important to you? Why do you want to run faster, lift more, or make more money in your job? How will you feel when you get there? How will your friends and family respond to you? How will your clothes fit? Will you have less pain when you walk or run? How will you put your newfound fitness to use? Will you take less medication? Will your hubby get more stiffys around you? Take a moment to think about why your goals are important. And if they aren’t important, take the time to set better goals. 2. Have a plan that’s Realistic. How are you going to achieve your goal? This is the “blank area” we need to fill in between stealing people’s underpants and making profit. Lookup underpants gnomes if you missed the reference there. I can wait. What I am getting at here is that you will benefit from planning out several smaller steps on the way to reaching your goals. If we keep going with the weight loss example, then we need to eat better and need to exercise. And should probably make sure we have adequate sleep as too. What am am I going to do, for how long, how often? Who am I going to go with? What am I going to wear? What do I do if I am running late at work and don’t have workout clothes in my car? Join a gym (preferably mine), or hire a trainer. Print out a class schedule and tape it to your desk and fridge. Go shopping for workout clothes if you don’t have them. Put workout clothes in your car. Pack snacks in case you missed lunch. Pull out your calendar and plug in the days/times you will go to the gym. Set an alarm in your phone to remind you when you need to leave to make it to the gym on time. This might seem like a lot. But I want you to think of it as several small victories on the way to your accomplishment. Even if you don’t make it to the gym today, if you print out that schedule and pin it up, then it is one small step closer to getting there. It will feel good to check that off your list and those small victories will start building up momentum. 3. Take a hard look at your Environment. “Knowledge doesn’t shape behavior, environment does”. This is my favorite takeaway from my favorite book on behavior change, Switch, by Chip and Dan Heath. The average American knows broccoli is more healthy than French Fries, yet French Fries are the number one “vegetable” consumed in America and the main source of vegetables for many children. When my favorite treat food is in the house, it is a lot harder to resist craving. When I try to do work in my home, I am tempted to turn on the TV, play with my dogs, or snack instead. If I don’t plan ahead and pack a lunch, then I am more likely to eat less healthy food at a restaurant. The ways that your environment shapes your behavior are limitless. In one example, Chip and Dan Heath outline a popcorn study concluding that having a larger food container results in eating a greater quantity of food than when given a smaller container, even when neither group finished the whole serving. Simply eating off of smaller plates, or packing food in 3-compartment containers makes eating smaller portions less of a struggle. Those who know me well know that I do most of my “work” and writing at coffee shops, tap houses, and low-traffic restaurants with wifi. I know that I get distracted at home and even when trying to do work at my gym office, so I change my environment entirely by traveling to a cafe to get shizz done. You may find that having a home gym makes you more likely to workout because you don’t have to travel as far and can workout at any time. Or you may find that trying to work out in a home gym is difficult because you can easily get distracted by chores, family, the fridge, or TV. I personally find that despite having a home gym, a fully loaded CrossFit box, and a decade of training and coaching experience, that I get distracted easily when working out on my own. I get more work in less time when I workout with a group, so I try to attend classes at CrossFit Tigard whenever I can to stay focused and have more fun. So take one more look at your environment and make note of anything that can stand in the way of your goals. If you can change your environment, you can change your behavior. Put your junk food in the garbage or donate it to college kids. If it’s not in the house, it will be a lot harder to eat it. Put a cucumber in the fridge and slice it up. You’ll be more likely to eat little crunchy cucumber slices. You can cry on the inside a little as you mourn your Tostidos. But you are eating those cucumbers. A support system is an important part of your environment that can help you to be successful. Make sure your friends and family are supportive of your goals. Explain why it’s important to you and how they can help you along the way. If you don’t have friends or family who can support you, consider hiring a trainer or mentor to work with weekly or monthly for accountability and to guide your progression. When I felt most overwhelmed with my business I hired a business coach/mentor and it made all the difference in the world. Many people find that they are more likely to get the work done when they know they have to answer to someone. And sometimes you just need to vent to someone who is invested in you. Jamie has my back. We often hear from our members at CrossFit Tigard that their favorite part of the experience is the welcoming and supportive community. Having people who look forward to seeing you at the gym and who will reach out to you if you go missing is a powerful thing, and friends make everything more fun. Find your tribe. Find your workout accountability buddy. Find your coach. 5. Know when you are Successful. When you set your goals earlier, you were specific and you set a goal that’s measurable, didn’t you? If not, go back to your goal and spend some time deciding how you will measure your progress. How will you know when you are successful? Make sure your goal is objective and measurable. Set checkpoints along the way where you can evaluate progress. We are a big fan of our InBody machine for quantifying changes in body composition beyond the number on the scale. You can also pay attention to how your clothes fit. Or set action-related measurements such as “prepping 2 meals per day in advance”, or simply spending 30 minutes per day working on your project/goal. Each day you can evaluate whether or not you accomplished those actions and will know if you are successful. If you don’t know how to measure you progress or would like help with your road map, Check Out Our Progress Coaching Program. 6. 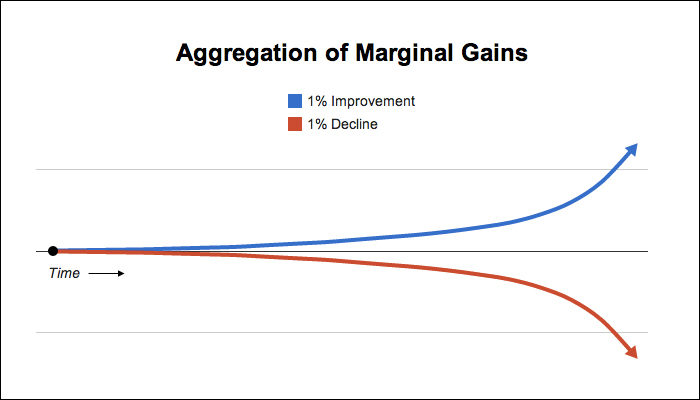 Final Note: Accumulation of Marginal Gains. James Clear wrote an Article about the Aggregation of Marginal Gains. He laid out how the British Cycling team approached the goal of winning the Tour De France in 5 years time. They looked for small ways to be 1% better in as many different areas as possible: Selecting pillows that improved sleep; Learning hand washing technique to help prevent illness (and lost training time); And of course more obvious things like nutrition and bike ergonomics. The result? They won in just 3 years. And again the year after. The takeaway is that making things 1% better won’t seem to make much difference today, this week, or even in a few months, but over the course of a year or years, having 1% better recovery, 1% better training days, and other 1% improvements every day add up to some incredible results. He posed that “Almost every habit that you have — good or bad — is the result of many small decisions over time”. I want you to think each day if the decisions you made moved you closer towards or further away from your goals. Even if you didn’t accomplish your goal or everything you wanted to do today, if you made decisions to get closer, then you are on the right track. And if you DID make a “poor” decision, you don’t have to wait until tomorrow or next week to reset. You can still move closer and be 1% better with the very next decision you make.